10 January 1943: Keel laid by the Boston Navy Yard, Charlestown, Mass. 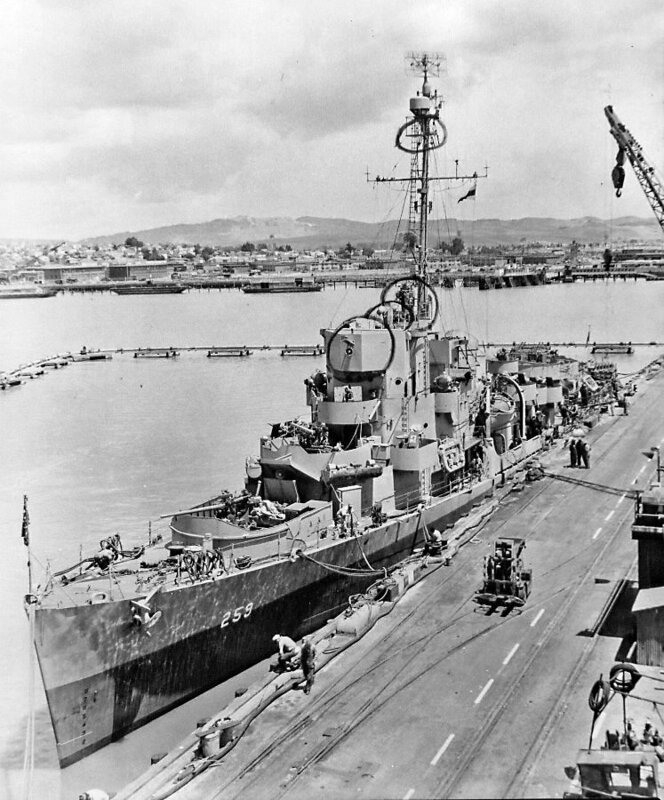 17 December 1945: Decommissioned at the Mare Island Navy Yard, Vallejo, Cal. 35k William Cicero Miller was born on 18 July 1919 in Thomasville, N.C. and enlisted in the Navy as an apprentice seaman at Raleigh, N.C. on 20 October 1937. 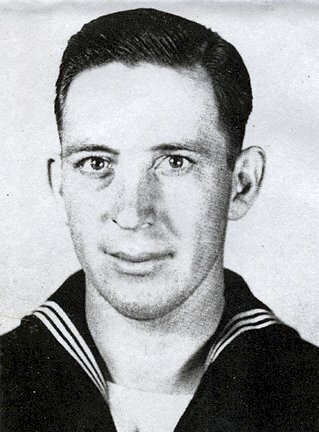 After instruction at the Naval Training Station, Norfolk, Va., Miller was advanced to the rate of seaman 2d class on 21 February 1938 and joined Scouting Squadron (VS) 6, attached to the aircraft carrier Enterprise (CV 6), on 30 September of that year. Miller remained with VS-6 into 1941 and became the rear-seat man for Lt. Clarence E. Dickinson, Jr. around April of that year. In the ensuing months the two became an efficient pilot/radioman team; and, on the morning of 7 December 1941, they both boarded their aircraft, a Douglas SBD-3 Dauntless, for what was to be a routine scouting flight. They were under orders to proceed to Ford Island and land there to refuel. Their ship, Enterprise, together with the rest of Task Force 8, would return later that day. Dickinson and Miller arrived over Oahu to discover the Japanese attack on Pearl Harbor underway. After one of the section had been shot down by a Japanese fighter, the commander of VS-6, Lt. Comdr. Halstead Hopping, broadcast the word that Pearl Harbor was being attacked. Miller and the other rear-seat men immediately unlimbered their .30-caliber machine guns. Attacking "Zero" fighters riddled Dickinson's plane, but Miller, already wounded once, downed one and ultimately exhausted his ammunition in the defense of the aircraft until she had been set afire. Dickinson called for Miller to bail out but received no answer. The pilot managed to get out of the falling plane; but Miller, either dead or so severely wounded that he was unable to free himself from the aircraft, remained with it until it crashed into a cane field. 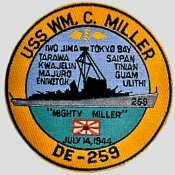 For his devotion to duty, despite his wounds, Miller was awarded a posthumous commendation by the Commander in Chief of the Pacific Fleet. 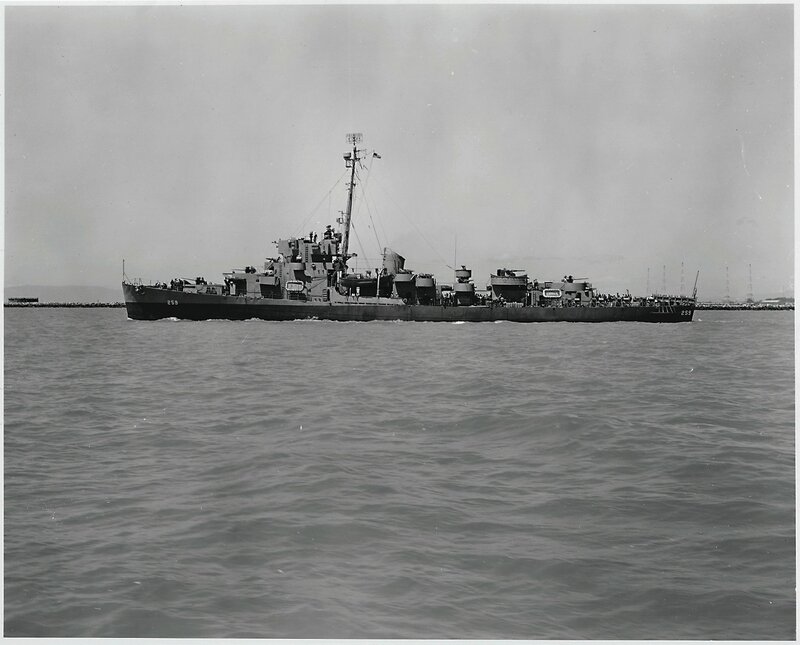 243k 15 May 1945: Broadside view of William C. Miller off Mare Island. 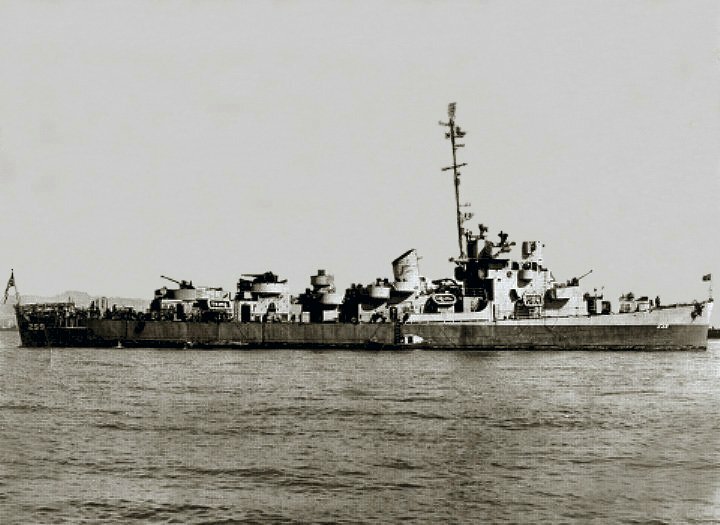 She was in overhaul at the yard from 12 April until 28 May 1945. 354k 15 May 1945: San Francisco Bay - Port quarter view of William C. Miller off Mare Island. 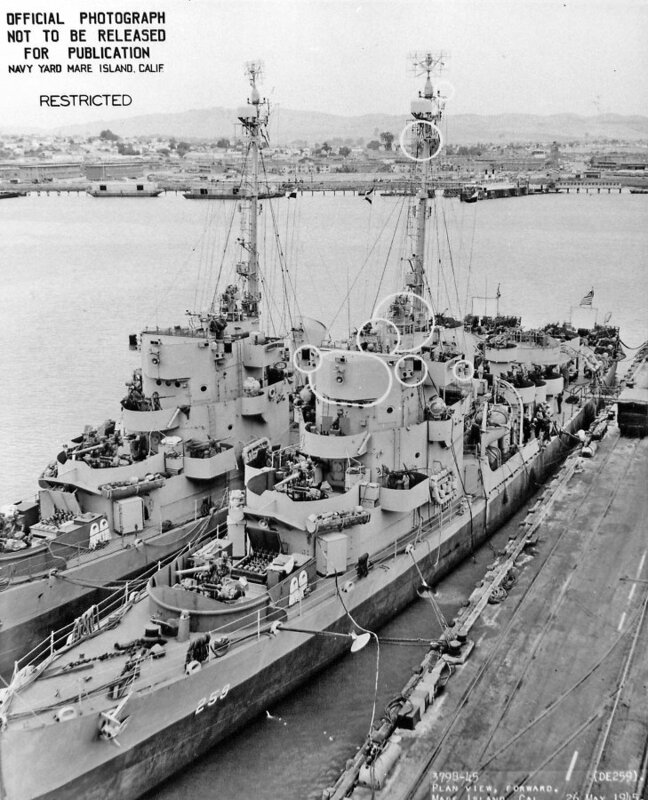 97k 15 May 1945: San Francisco Bay - Port quarter view of William C. Miller off Mare Island. 162k 19 May 1945: After plan view. Stern of the USS Pensacola (CA 24) is in the background. 159k 19 May 1945: Forward plan view. 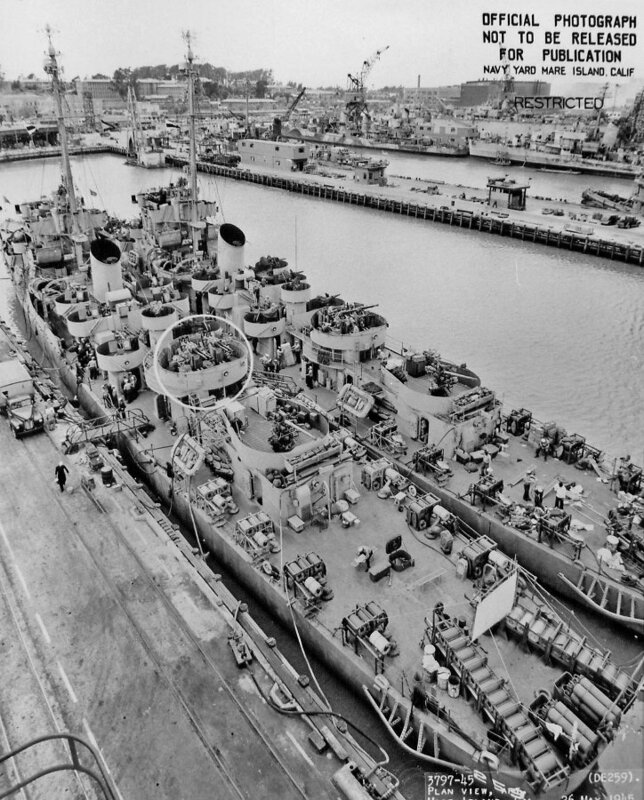 206k 26 May 1945: After plan view of William C. Miller inboard and Cabana (DE 260) outboard at Mare Island. Both ships received new 40 mm gun mounts during their overhauls. 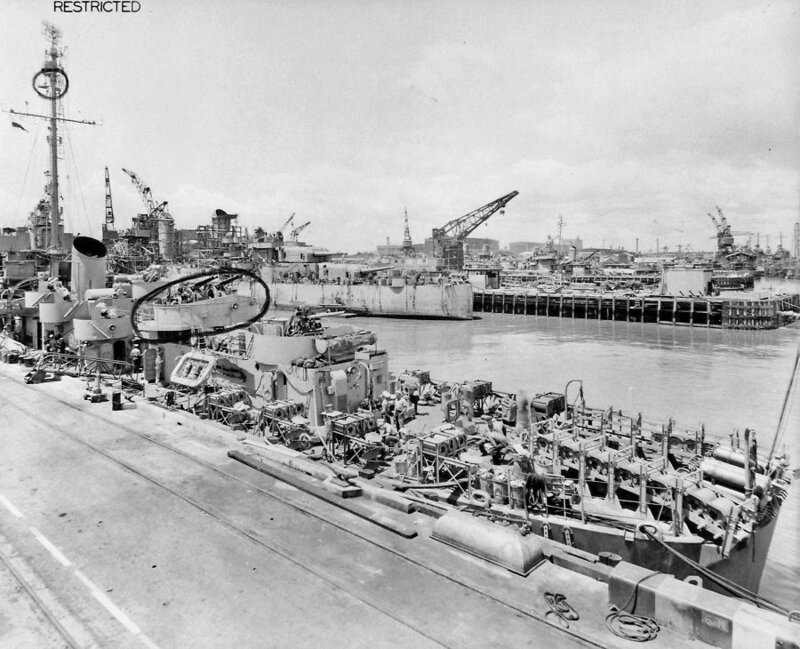 Other ships in the background are O'Brien (DD 725), USS Kimberley (DD 521), Howorth (DD 592) and ARD 11 (with Coghlan (DD 606) in the dock). 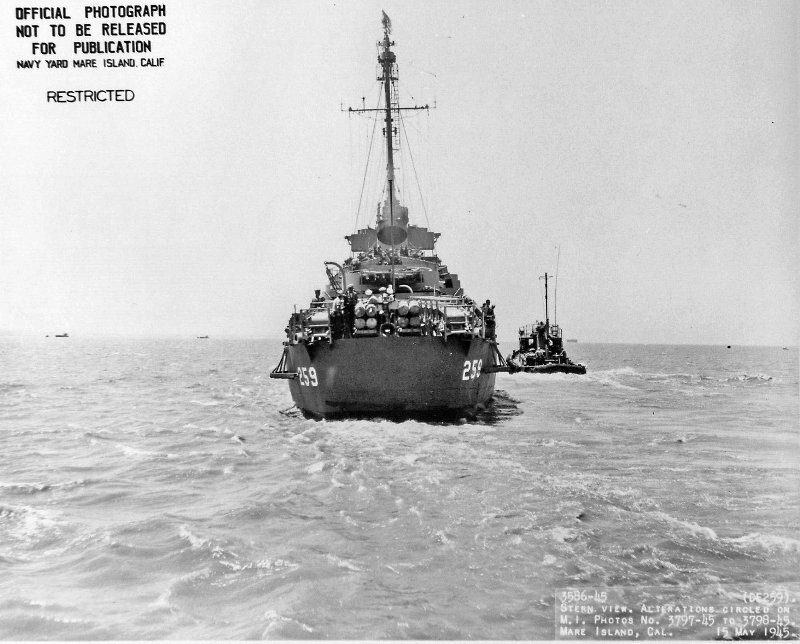 179k 26 May 1945: Forward plan view of William C. Miller inboard and Cabana outboard. 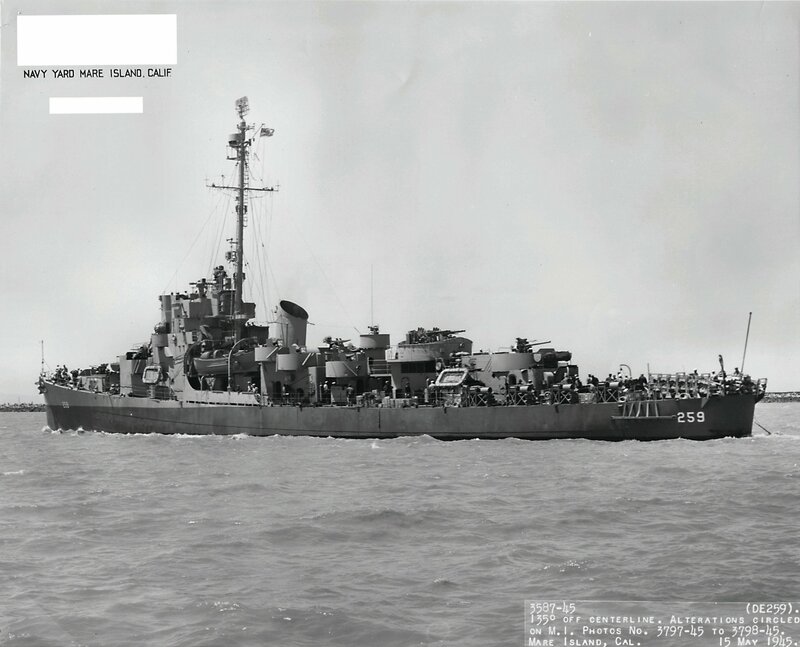 View the USS William C. Miller (DE 259) DANFS history entry located on the Naval History and Heritage Command web site.